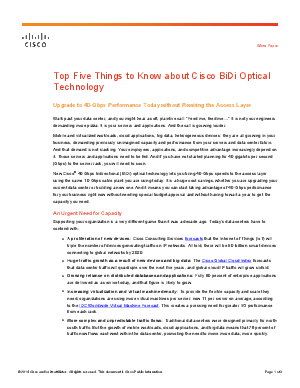 New Cisco® 40-Gbps bidirectional (BiDi) optical technology lets you bring 40-Gbps speeds to the access layer using the same 10-Gbps cable plant you are using today. It is a huge cost savings, whether you are upgrading your current data center or building a new one. And it means you can start taking advantage of 40-Gbps performance for your business right now without needing special budget approval and without having to wait a year to get the capacity you need.